U.S. Sen. Mark R. Warner (D-VA) followed up on his request to more than three-dozen federal agencies to provide Digital Accountability and Transparency (DATA) Act implementation plans, and requested updated plans from the agencies. The DATA Act is the 2014 bipartisan federal financial management and transparency legislation authored by Warner and signed into law, which has been described as the most significant open-government initiative since the Freedom of Information Act of 1966 and is the nation’s first open data law. The request follows up on a letter sent by Sen. Warner in April of this year. The agencies’ responses to that letter came prior to final issued implementation guidance from the Office of Management and Budget (OMB) and the Department of theTreasury. With the publication of data standards by Treasury on April 29th, and the release of final implementation guidance by OMB on May 3rd, agencies have the necessary information to begin converting their spending information into open data. Today’s letter by Warner notes some common challenges identified by the agencies in their initial responses, and requests each agency’s resubmitted plan based on this new guidance. 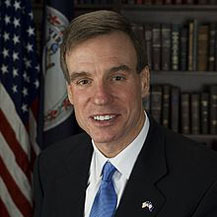 Sen. Warner is a former business executive, governor of Virginia, and chairman of the Budget Committee’s bipartisan Government Performance Task Force from 2010-15. His bipartisan DATA Act was cosponsored in the Senate by Ohio Republican Sen. Rob Portman, and the House companion was sponsored by California Republican Rep. Darrell Issa and Maryland Democratic Rep. Elijah Cummings. Identical letters were sent to: the U.S. Department of Agriculture, U.S. Department of Commerce, U.S. Department of Defense, U.S. Department of Education, U.S. Department of Energy, U.S. Department of Health and Human Services, U.S. Department of Homeland Security, U.S. Department of Housing and Urban Development, U.S. Department of the Interior, U.S. Department of Justice, U.S. Department of Labor, U.S. Department of State, U.S. Department of Transportation, U.S. Department of the Treasury, U.S. Department of Veterans Affairs, U.S. Agency for International Development, Environmental Protection Agency, General Services Administration, National Aeronautics and Space Administration, National Science Foundation, Nuclear Regulatory Commission, Office of Personnel Management, Small Business Administration, Social Security Administration, Corporation for National and Community Service, Federal Election Commission, Federal Maritime Commission, Merit Systems Protection Board, Millennium Challenge Corporation, National Archives and Records Administration, National Endowment for the Arts, National Endowment for the Humanities, National Labor Relations Board, Occupational Safety and Health Review Commission, Overseas Private Investment Corporation, Pension Benefit Guarantee Corporation, Securities & Exchange Commission, U.S. International Trade Commission, National Credit Union Administration, Federal Deposit Insurance Corporation, and the Federal Communications Commission.